My all time favourite posts ever have got to be favourites post as I love seeing what products everyone is loving, but during 2017 I kind of lost my love for posting them every month here on the blog. So moving into 2018 i'm not going to be forcing favourites, and posting as and when I feel I have new products to share! However it didn't feel right to not do a 2017 beauty favourites, so here are the products that I absolutely loved during 2017! Kicking it off with skincare, because if you read my 2018 Beauty Goals you'll know that I want to focus more on skincare going into this year. A brand that has fully impressed me this year has been Clinique as i've not really tried any of their products prior to this year, and i've loved trying a few products from them this year. The Clinique Take Off The Day Cleansing Balm (£23) deserves all of the hype that gets because it is probably one of the best cleansing balms I have ever tried. It melts every type of makeup away and leaves my skin feeling clean, but also nourished. Another product from Clinique that i've loved this year, so much so that i've recently repurchased another tub is the Clinique Pep Start Hyrdoblur Moisturiser (£24.50) which i've spoken about a lot over the months as it's amazing for skin lacking a bit hydration but also needs a bit of pore blurring. 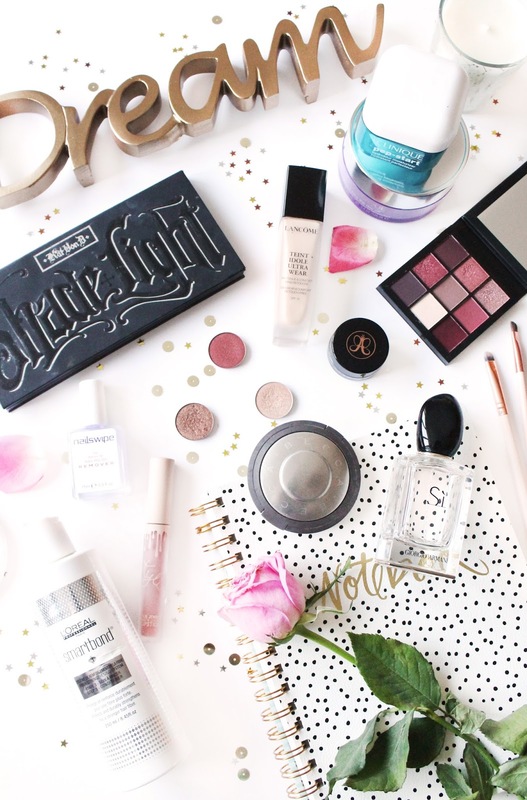 During 2017 I definitely found a fair amount of beauty products that have completely blown me away and I will continue to love for a fair few years to come. My favourite foundation of 2017 has got to be the Lancome Tient Idole Foundation (£31.50) as i've raved non stop ever since I was very kindly sent this, and have since repurchased it. It's an incredible foundation that gives a lovely amount of coverage that isn't too heavy what so ever, which is what I look for in a foundation. A face palette that I have used everyday since I purchased it back in Feb is the Kat Von D Shade & Light Palette (£37) which is hands down the best contour palette I have ever used, yep the best! I find myself able to use all of the shades within this palette depending on if i've tanned or not, and it works whichever way you want it to. If you want a natural contour, it does that, and if you want a more defined contour, it's great for that also! A few products that I purchased whilst in Australia have also made the cut into my 2017 beauty favourites and are some of my favourite products to date. The Becca Cosmetics Champagne Pop Highlighter (£32) had been on my wish list for an age, so when I saw it in Sephora I just had to have it and it has never disappointed me (other than the fact it smashes so easily, but I can get past that). Another product I picked up whilst in Sephora was the ABH Dip Brow (£19) of which I actually got colour matched to because there were far too many shades to choose from, and i'm so glad I did because I picked up the most perfect shade! I absolutely love this for making my brows look normal and if you haven't tried it for yourself then you are missing out! The last product that I treated myself to in Australia was the Giorgio Armani Si Perfume (£73) which I had wanted for such a long time and it has been my most used fragrance this year, so much so that there isn't much left in this bottle. My favourite lip product of this year will come as no surprise as one of these was in my beauty favourites of last year, and it is of course the Kylie Cosmetics 'Bare' Matte Liquid Lipstick from her vacation collection. For anyone who has tried out her lip kits, then you'll know how amazing they are (even if you do have to pay hella expensive customs fees) and if you haven't, then you need to because i've not found a liquid lip that comes anywhere near close to these, including the ColorPop ones. The last two products within this years beauty favourites are a bit miscellaneous but have overly impressed me this year. My favourite and most used hair care product of this year has been the L'oreal Smartbond Conditioner* (£16.01) which is an at home treatment that works with their Smartbond range, which is stocked in salons across the country. (You can read a little more about my experience with Smartbond here). The last product that I wanted to give a quick mention is the Nail Swipe Nail Polish Remover* (£2.60) which is nail polish remover that works slightly different but I find so much more effective. Essentially you apply this as you would a nail polish and leave it for a couple of minutes to work into the nail polish before wiping away with a cotton pad. I find this works so much quicker than ordinary nail polish remover and you use so much less product in doing so. If you're a lover of switching up your nail colours then i'd highly recommend this product!